MRI is the abbreviation for magnetic resonance imaging. This is a noninvasive diagnostic technique that produces computerized images of internal body tissues, and is based on nuclear magnetic resonance of atoms within the body induced by the application of radio waves. This computer analysis enables doctors to see the finest detail within the body. Not all patients can have MRIs. 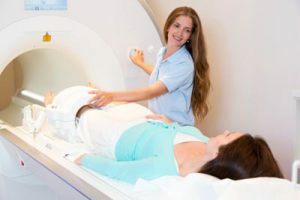 Patients with pacemakers, defibrillators, certain types of implants, especially older brain vascular clips, spinal cord stimulators, and bladder stimulators are often not able to have MRIs.